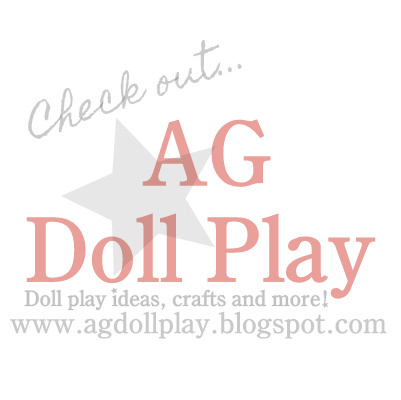 After reading this post from the Doll Delight blog we decided that our dolls too needed a May Pole to have fun with this Spring. We used a section of a wrapping paper tube, some patterned paper that we adhered around it, some ribbon and some silk flowers and the ribbon spool for the top. Our May Pole is standing upright by being placed in a glass. Making the May Pole was easy enough...getting all of the dolls standing and holding onto the ribbon was not! We finally settled on setting the girls up on our picnic table...which is where once I got them all set up the wind started to blow and some of the girls decided to dive off the table and others let go of their ribbons. Have you ever done a project for your dolls and have it turn out to be not so much fun or somewhat of a disaster? I'm telling myself that we still had fun...I think we did. Zoey might say otherwise since she was the one holding up the dolls and the May Pole in-between my getting the dolls all set up and in place...over and over again. My little sister thinks exactly like Zoey! :) She is ALWAYS holding stuff for me. Great job!! I didn't have the guts to try a Maypole, but now that you and another have done it, I am bound and determined to try it next year. I think you did a magnificent job in spite of the wind. That is my biggest problem when I take photos of my dolls outside. Getting dolls to stand outside is aggravating.